Originally published on March 9, 2003. The review originally said that Mamoru Oshii directed the film, which is incorrect. It has since been corrected. This is another “short review” where the first paragraph is summary and second paragraph evaluation. In an alternate post-WWII scenario, Japan is on the brink of social chaos. The occupation has failed to turn Japan into a stable society by the late 1950s. Anti-government protesters and terrorists regularly battle with the authorities, setting off napalm cocktails and bombs. To combat the disorder, a storm-trooperesque division of the police–the Special Forces–is formed. This force is decked out in Nazi-style helmets with glowing red infrared eyeholes, and they are as ruthless as wolves in hunting their prey. But one day, Fuse, an ordinary member of the Forces, encounters an innocent Little Red Riding Hood-like girl clutching a backpack full of explosives. He survives the blast, but she does not. In the aftermath, Fuse goes on a soul-searching journey to discover why he didn’t have it in him to shoot her first, all while poltical forces conspire to get rid of the Special Forces altogether. 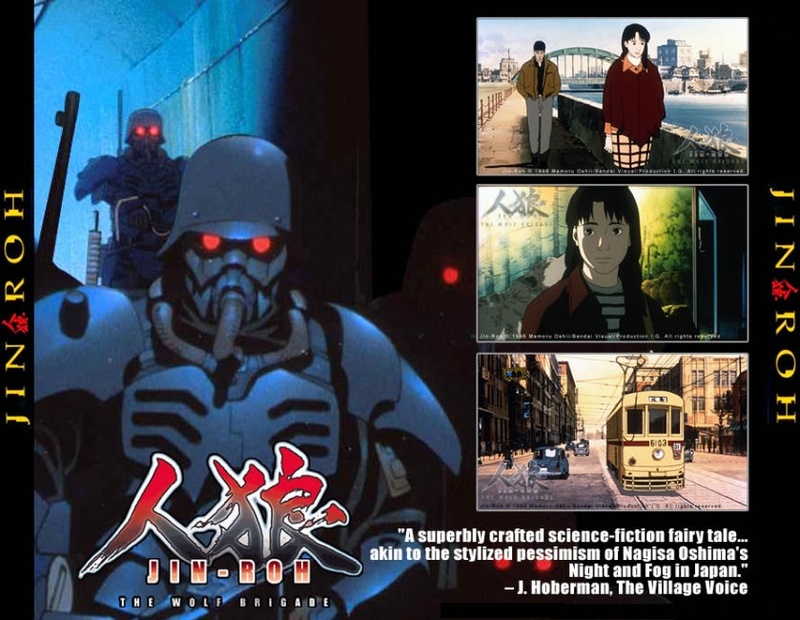 Jin-Roh is a deeply intelligent, mature animated film that seems to belong in a seperate category from most Japanese anime. The dystopian 1950s Japan depicted in the film is bleak, but believable. Oshii’s reflective, meditative style serves him well this time, unlike in the pretentious Ghost in the Shell–by keeping the focus on the main character’s self-discovery and on the theme of the effects of violence on the human soul, as well as the deft parallels to the original Little Red Riding Hood tale, the film achieves a kind of resonance and significance rare in anime. Sometimes the political relationships between the two different police forces are confusing, but the dramatic core of the story–the budding relationship between the suicide bomber’s sister and Fuse–is strong, and is a vehicle for character exploration. Also, the memorable soundtrack by Hajime Mizoguchi (with a little help from Yoko Kanno) shines, accentuating some deeply powerful and unsettling scenes. The film may not be for everyone, as its pacing is deliberate and its politics are tangled. But for those with the patience to look under its surface, there is a rewarding amount of depth to discover. The Special Edition DVD, with a soundtrack CD and an extra disc included, is highly recommended for purchase. Nice review! Right now Iâ€™m listening to the Grace; it is the last song on the OST. JinRoh is one of the most depressing and most beautiful movies I’ve seen in my entire life. To tell you how much I love it, out of millions of anime DVDs out there, I only own one on DVD; Jin Roh is the one and only anime i have with arc book, OST and DVD. This is a movie every anime lover should watch.